THE Boston Globe reports the injury toll after two bombs rocked the Boston Marathon has now risen to 125. Three people were killed in blasts, including an 8-year-old boy, according to two law enforcement sources briefed on the investigation. US president Barack Obama says those responsible will feel the 'full weight of justice'. "The nation will remember Boston in their prayers tonight,'' Mr Obama said. "Federal officials are mobilising resources to help. I've notified leaders of both parties; they agree that on days like this, there are no political parties. "Police, firefighters, first responders, and the National Guard responded heroically. We salute all those who responded so quickly and professionally to this tragedy. "We still do not know who did this or why; we still don't have all the facts. "We will get to the bottom of this. We will find who did this and we will find out why they did this. Any responsible people or groups will feel the full weight of justice. "Today is Patriots Day, a day that reflects the freedom Boston has celebrated throughout its history. "Boston is a tough and resilient town; so are its people. I'm sure the people of Boston will pull together. The US has stepped up security across key landmarks in New York and Washington. THE Boston Athletic Association has issued a statement extended sympathy to those affected by bomb blasts in the city during the running of the Boston Marathon. The post, made on the association's Facbook page at 8pm local time, attracted thousands of likes and shares inside half an hour. The Boston Athletic Association extends its deepest sympathies to all those who were affected in any way by todays events. Today is a sad day for the City of Boston, for the running community, and for all those who were here to enjoy the 117th running of the Boston Marathon. What was intended to be a day of joy and celebration quickly became a day in which running a marathon was of little importance. We can confirm that all of the remaining runners who were out on the course when the tragic events unfolded have been returned to a community meeting area. At this time, runners bags in Boston which remain unclaimed may be picked up by runners presenting their bib number or proof of race participation at the Castle, at 101 Arlington Street, in Boston. At this time, we are cooperating with the City of Boston, the Commonwealth of Massachusetts, and all federal law enforcement officials. We would like to thank the countless people from around the world who have reached out to support us today. Carlos Arredondo speaks about helping victims of Boston blast: Peace activist Carlos Arredondo speaks about helping people affected by the blast at the Boston Marathon. Prime Minister Julia Gillard offered her condolences to the families of those killed in the Boston bombings. "It will be some time before we know the full extent of what has occurred but these explosions have cast a long shadow over one of the world's great sporting events, Ms Gillard said in a statement. "The Australian Consulate-General in New York is making urgent enquiries to determine whether any Australian citizens may have been involved in this attack. "They are unaware of any Australian casualties. "Australian runners were scheduled to compete. DFAT is currently contacting these athletes to confirm their safety." Opposition leader Tony Abbott said the thoughts of all Australians were with the people of Boston. "The Coalition joins with the Government in expressing our shock and sorrow at this morning's terrible events," Mr Abbott said in a statement. "The Boston Marathon is an iconic event known around the world. It doesn't just draw long distance runners from many countries including Australia, it brings out the people of Boston to support the athletes. That's what makes the Boston Marathon special and what has happened today even more terrible. "This morning I contacted United States Ambassador Jeffrey Bleich to convey condolences to the families of those killed. "While it appears there are no Australian casualties, Australians who have concerns about loved ones should make contact with DFAT." Foreign Minister Bob Carr said the explosions were more than likely the work of terrorists, although that was yet to be confirmed. "We know that home-grown terrorists have been a feature of life in Europe, the United States and here," Senator Carr told reporters at Sydney airport. "It is legitimate to be concerned about the prospect that this does represent a domestic terrorist strike." Senator Carr said consular officials were "hopeful" no Australians had been harmed in the attacks, but they remained "anxious". He said it remained unclear how many Australians were running in the marathon. There had been no change in advice for Australians travelling to the US, he said. He also dismissed the possibility of the explosions inspiring other terrorists to strike. Queensland Premier Campbell Newman opened the parliamentary session by expressing his sorrow for the people and families affected by the explosions. Mackay long-distance runner and Olympian Benita Willis was "just a few streets away" when explosions rocked the finish line of the Boston Marathon. Ms Willis took to Twitter following the blasts. "Scary stuff here in Boston. I'm ok & our runners are ok," she tweeted. Her mother, Merilyn said she was relieved to learn her daughter was okay. Massachusetts General Hospital was treating 19 victims, spokeswoman Susan McGreevey said. Tufts New England Medical Center had nine patients "and we're expecting more," said spokeswoman Julie Jette. Brigham and Women's Hospital reporting they have 18 to 20 injured from the explosions, two critical. Sources told NBC news the blasts had preliminarily been sourced to as many as four rudimentary, possibly "homemade" devices, two of which had gone off. There was word shared by a Massachusetts member of Congress that an additional device had been found and remotely detonated by bomb squad experts in a nearby hotel. The New York Post reports a bomber was seen on CCTV footage and a Saudi national - aged 20 - is being held with burn wounds in the Boston Hospital. But a short time ago, US authorities denied this. The scenes in Boston - from across the Charles River a dark plume of smoke could be seen rising while helicopter video shots showed blood spilled over a large area of pavement at the site of the blast - sent waves of dismay through America, which has not suffered any successful attacks since 11 September 2001, more than a decade ago. Even while there was no confirmation it was a terrorist event, special precautions were triggered, including the closing down of Pennsylvania Avenue close to the White House in Washington DC to foot traffic. The Associated Press reported that "two more explosive devices" had been found by police and were "being dismantled". Meanwhile, flights have been cancelled into Boston Logan Airport. A police spokeswoman said there had been a third blast at the John F. Kennedy Library, around three miles from the marathon finish line. A library spokeswoman said there had been a fire at the library but no injuries. Sporting events have since 9/11 been of particular concern for American counter-terrorism forces because of the difficulty of protecting them. Huge protection is routinely provided for events from the World Series baseball tournament to the Super Bowl as well as the annual New Year's Eve celebration in Times Square. The blasts came within seconds of each other some three hours after the winners of the race had already crossed the line, but stragglers were still approaching the area close to the heart of the city's downtown. Police and medical personnel rushed to the scene as terrified members of the public attempted to flee. Many of those injured were treated on the spot before being transferred to area hospitals, including Massachusetts General. Witness said they saw numerous wounded victims on the scene and that many of the injuries appeared to be severe, some possibly involving the loss of limbs. The explosions occurred on Boylston Street in the popular Back Bay retail district and many windows were blown out. It was very crowded as one of the prime viewing spots for the annual race. Television viewers saw highly distressing images of the blasts with soundtracks of screaming. "I heard two big explosions large plumes of smoke, dust, glass… At first it seemed like a cannon blast but it felt so strong it literally almost blew my head off. There were some really, really bad injuries, some people were really badly hurt," said one spectator who rushed to site of the explosions in the moments after they happened. Cherie Falgoust was waiting for her husband, who was running the race. "I was expecting my husband any minute," she said. "I don't know what this building is ... it just blew. Just a big bomb, a loud boom, and then glass everywhere. Something hit my head. I don't know what it was. I just ducked." In an all-out response to the horror, the city closed the T-line, a subway that runs beneath Boylston, and sealed the nearby Massachusetts Bridge. Part of the city's airspace was also shut down. All off-duty Boston police officers were summoned and told to report for emergency duty to the local precinct headquarters. As soon as the wounded were attended to, work began instantly began on an investigation into the sources of the blasts with the early focus looking for forensic evidence and anything suspicious seen on surveillance cameras. White House officials said that President Barack Obama had been informed of events in Boston within minutes. "The president called Boston Mayor Tom Menino and Massachusetts Governor Deval Patrick to express his concern for those who were injured and to make clear that his administration is ready to provide needed support as they respond to the incident," the official said. The Boston Marathon is one of the most prestigious sporting events in America's calendar and for Boston it is usually a joyous day that marks the end of what are often harsh winters in the region. There are 27,000 runners representing 96 countries in the annual Boston marathon and at least half a million people traditionally line the route. Boston was the city where two of the flights hijacked on 9/11 originated from and the metropolis, on the Atlantic seaboard of Massachusetts, is as sensitive as any in the United States about the danger of terrorism attacks. The explosions occurred at around 3pm local time. In the mayhem, hundreds of late-arriving runners were re-routed and then denied usual medical attention, raising concerns that some faced risk of hypothermia. "Apparently there has been a bombing," Mr Biden was heard to comment. "I don't know any of the details of what caused it, who did it. I don't think it exists yet. But our prayers are with those people in Boston who suffered injury." "We are deeply saddened and shocked by the news from Boston," Nick Bitel, London Marathon Chief Executive, said in a statement. "Our immediate thoughts are with the people there and their families. It is a very sad day for athletics and for our friends and colleagues in marathon running. Our security plan is developed jointly with the Metropolitan Police and we were in contact with them as soon as we heard the news. TWO explosions shattered the finish of the Boston Marathon, sending authorities out on the course to carry away the injured while stragglers in the 42-kilometre race were rerouted away from the smoking site. 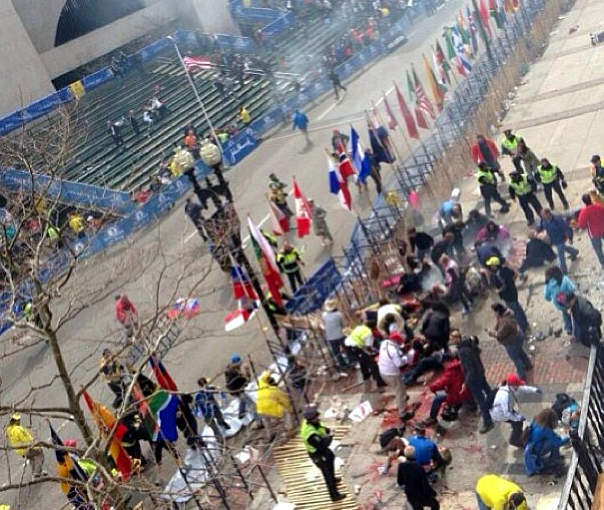 Boston Police tweeted a short time ago that there were 22 injured and two dead. Authorities later tweeted there were 19 patients at Mass General; six patients are critical, at least four with leg amputations. Six patients in surgery. USA Today reported that police found two more bombs and disarmed them, officials said. A third blast from a controlled detonation was heard downtown, according to US reports. The marathon organisers said the source of the explosions, which occurred in quick succession about 2:50 p.m. on Boylston Street near the intersection of Exeter Street, three hours after the winner had crossed the finish line. Some store fronts were blown out. Bloodied spectators were carried to medical tent intended for runners. Several of the injured had lost limbs, and at least one police officer was hurt. "Somebody's leg flew by my head. I gave my belt to stop the blood," spectator John Ross told The Boston Herald. Competitors and race volunteers were crying as they fled the chaos. Bloody spectators were being carried to the medical tent that had been set up to care for fatigued runners. "There are a lot of people down," said one man, whose bib No. 17528 identified him as Frank Deruyter of North Carolina. He was not injured, but marathon workers were carrying one woman, who did not appear to be a runner, to the medical area as blood gushed from her leg. A Boston police officer was wheeled from the course with a leg injury that was bleeding. About three hours after the winners crossed the line, there was a loud explosion on the north side of Boylston Street, just before the photo bridge that marks the finish line. Another explosion could be heard a few seconds later. Smoke rose from the blasts, fluttering through the national flags lining the route of the world's oldest and most prestigious marathon. TV helicopter footage showed blood staining the pavement in the popular shopping and tourist area known as the Back Bay. The White House issued a statement a short time ago, saying the US president Barack Obama was being briefed on the incident. "Shortly after being notified of the incident around 3pm EDT, the President received a briefing from Homeland Security adviser Lisa Monaco and other members of his senior White House staff in the Oval Office,'' an official said. "The President called Boston Mayor Tom Menino and Massachusetts Governor Deval Patrick to express his concern for those who were injured and to make clear that his administration is ready to provide needed support as they respond to the incident." "I have been in touch with the President, Mayor Menino and our public safety leaders. Our focus is on making sure that the area around Copley Square is safe and secured. I am asking everyone to stay away from Copley Square and let the first responders do their jobs." The Washinton Post is reporting that D.C. police have heightened security but did not say whether this stemmed from any specific threat. Terrance Gainer, the Senate Sergeant-at-Arms, said in an e-mail to Post reporter Ed O'Keefe that "there is no present indication of threats" to the Capitol, but that security will be increased "as a precaution." Reuters is reporting that the New York Police Department is stepping up security around Manhattan landmarks. Webcam vision of Boston Marathon finish line after explosions: Vision from the CBS Boston LIVE Finish Line Camera shows the scene after the explosions at the Boston Marathon.